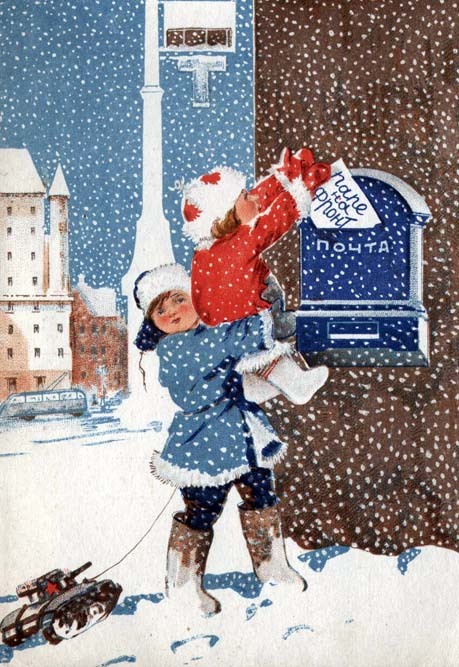 The tradition of sending New Year greetings cards disappeared in Russia at the start of the Civil War in 1917. In 1941, when the Great Patriotic War began, the Soviet government decided to reinstitute the practice to lift the spirits of soldiers and their families. The Soviet Union not only won the war, but strengthened its position in the world, becoming a superpower. 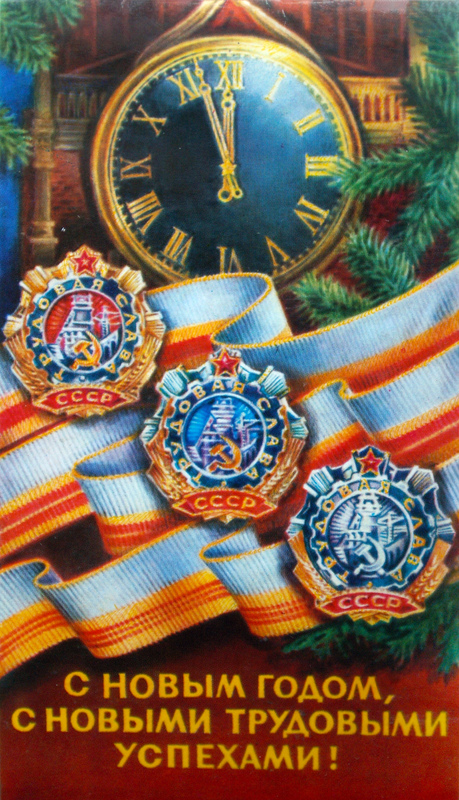 The symbols of the Red Empire remained on the majority of New Year cards for a long time to come. 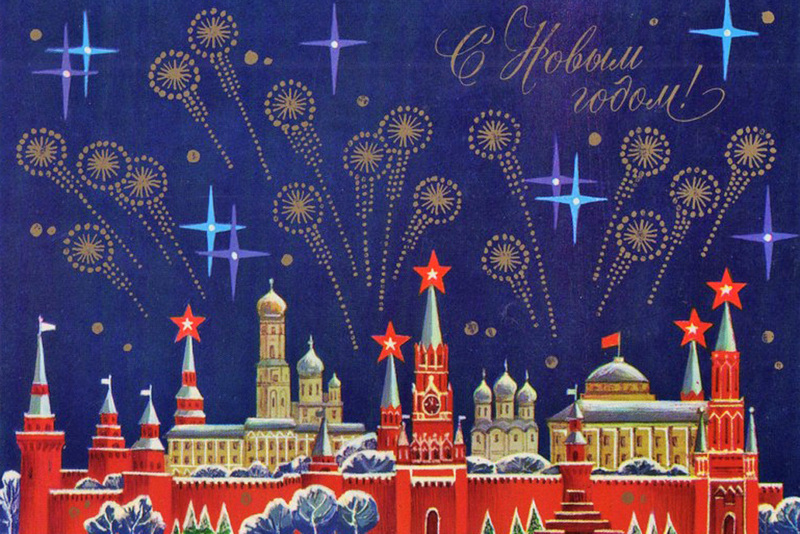 The architectural symbol of the USSR — the Moscow Kremlin — is most the frequently depicted building on New Year cards. The artists of the time avoided drawing crosses on the domes of the Orthodox churches inside the Kremlin. 1961 saw the first manned space flight. 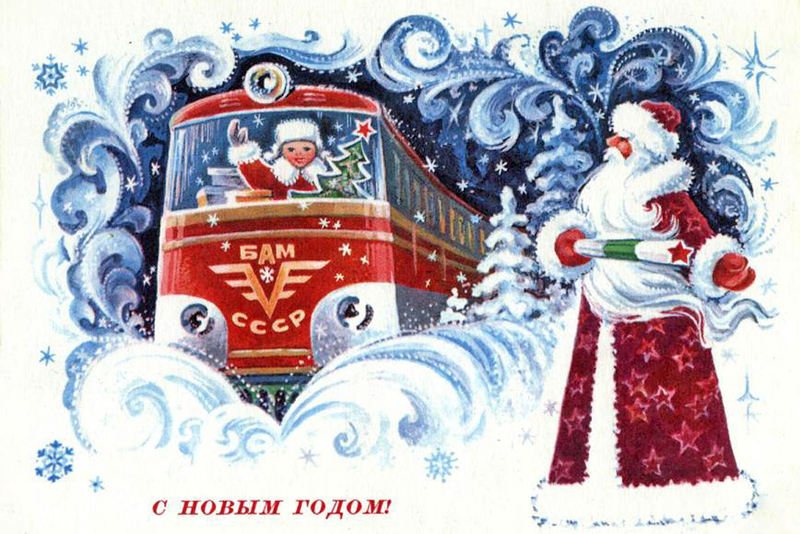 The resounding success of the USSR was, of course, illustrated on almost all New Year cards that winter. 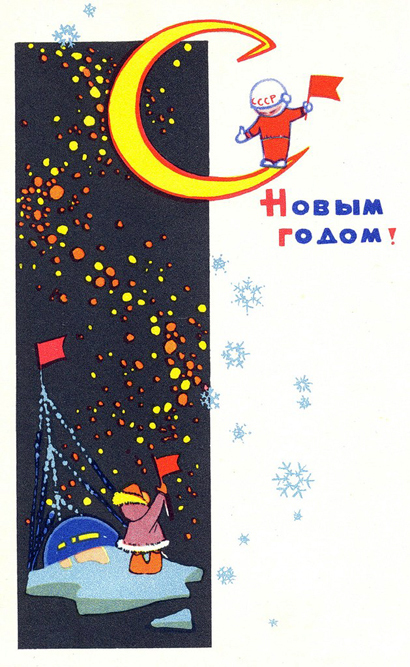 Most Soviet New Year cards portrayed classic, homely scenes: fir trees, toys, gifts, snowy landscapes. But some cards reflected the events of the past year. 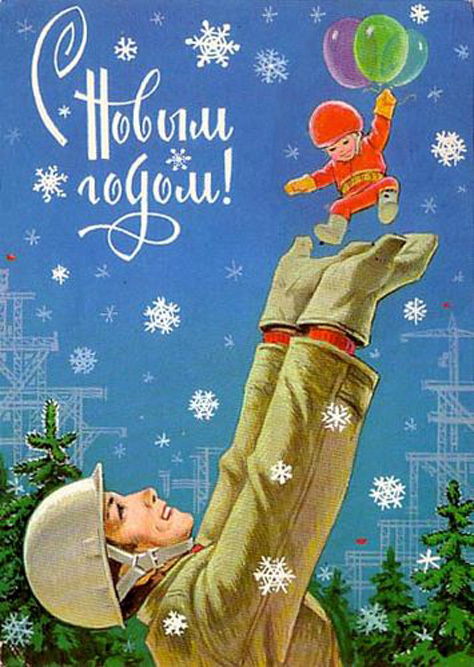 For example, this card was published in 1962, the year mass construction of Khrushchyovkas low-cost houses (and therefore the urbanization) has begun. 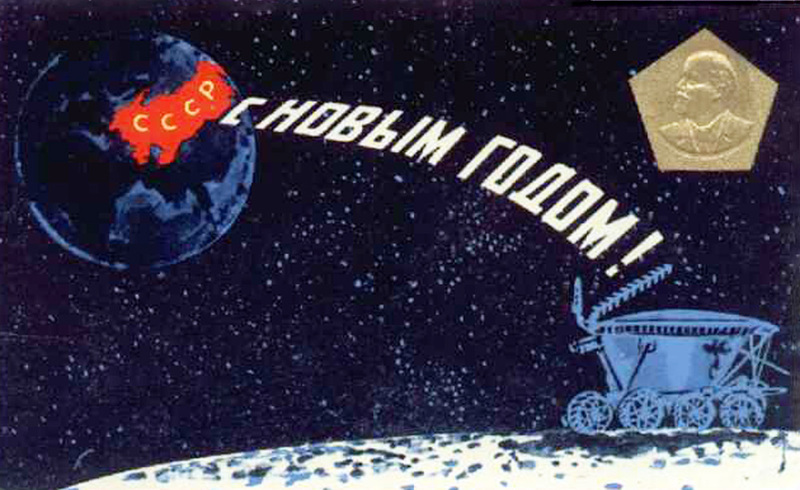 In 1966, the Soviet space program celebrated another victory. The first man-made instrument successfully landed on the surface of the Moon and transmitted pictures of our only natural satellite back to Earth. 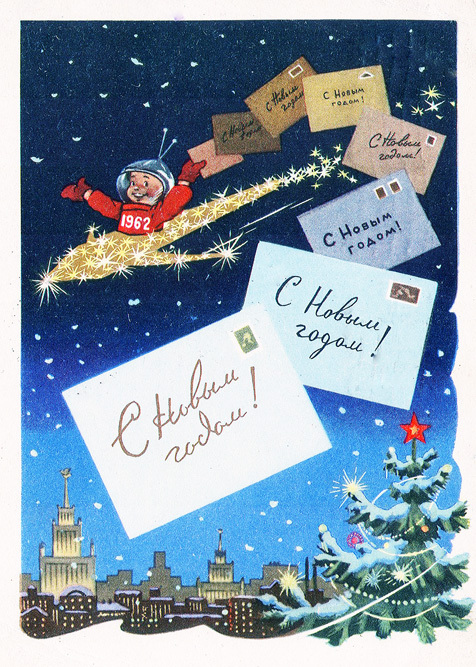 The image of the child cosmonaut was a regular feature on New Year cards for many years. This card depicted a meeting between a young astronaut and another hero of the day: the polar explorer. Polar expeditions at that time were shrouded in an aura of romance. In 1969, the first docking of two manned spacecraft took place. 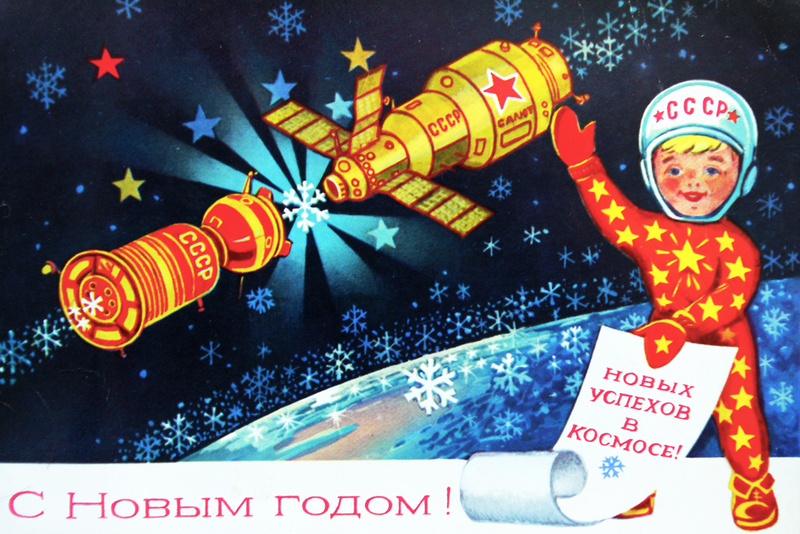 To celebrate New Year in a great country that had conquered space for the Soviet people was a double pleasure. One of the largest railways in the world — the Baikal-Amur Mainline — was built from 1938 to 1984. Not surprisingly, the project found its way onto numerous New Year cards. In a country where work was declared the highest form of human existence, people were rightly proud of genuine feats of labor. Cards like this one reminded people of the heroism of their compatriots. 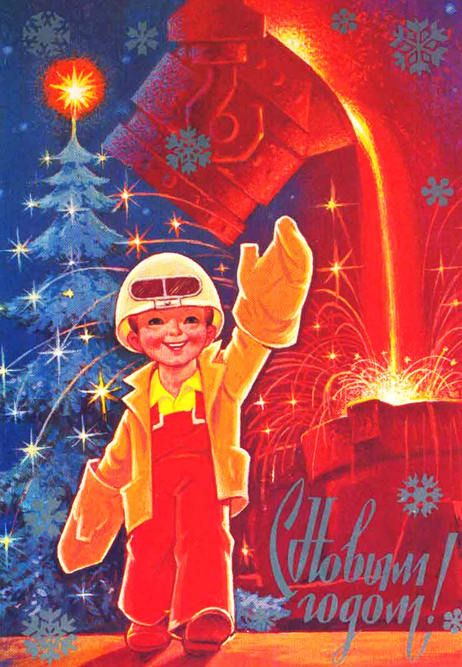 As representatives of the hardest and most back-breaking professions, metal-workers, miners, and builders got pride of place not only in newspapers and on posters, but also on New Year cards in the Red Empire. To make cards different from posters, workers were often portrayed as cheerful children. Incidentally, child labor was banned in Soviet Russia in 1917, its very first year of existence. In 1972, the Soviet Air Force took possession of a new aircraft. The Tu-154 still flies in Russia and other countries to this day. 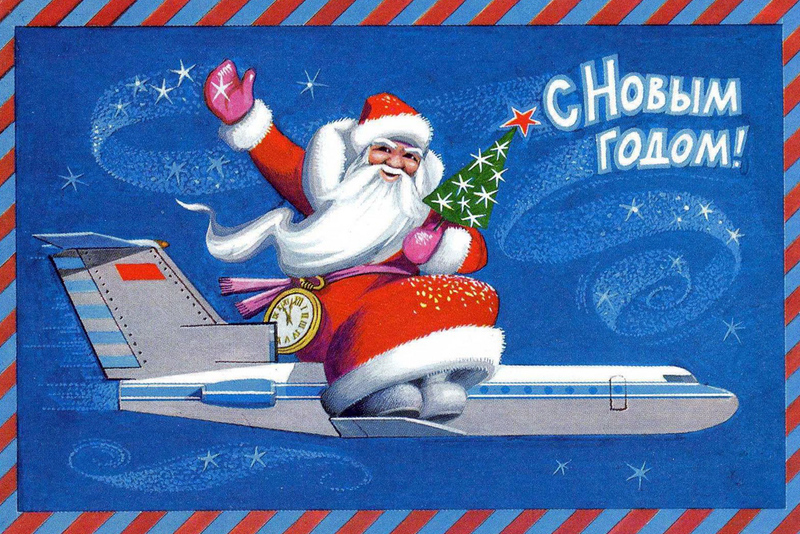 A total of 932 aircraft were produced, one of which was used by Father Frost (Russian Santa Claus) to transport gifts. In 1975, the world's second icebreaker, the Arctic, was launched onto the waves. The first icebreaker, the Lenin, was also built in the USSR in 1959. 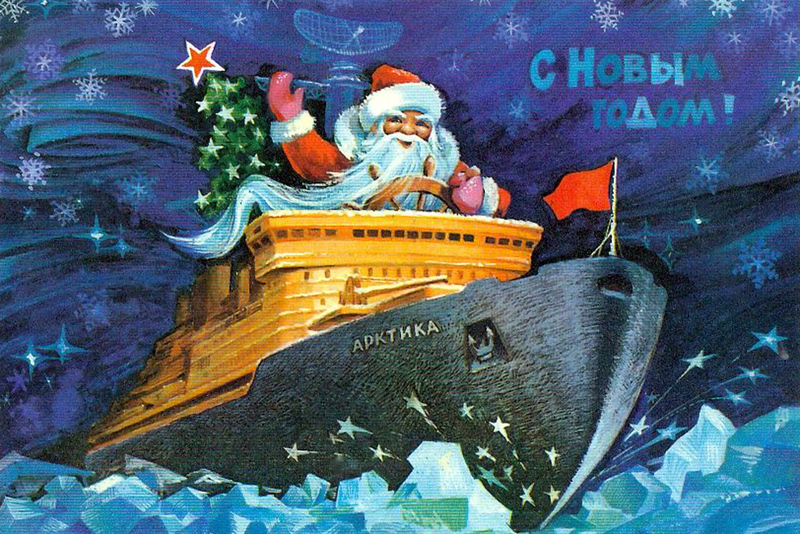 In 1977, with Father Frost on board, the Arctic was the first vessel in the world to sail to the North Pole. 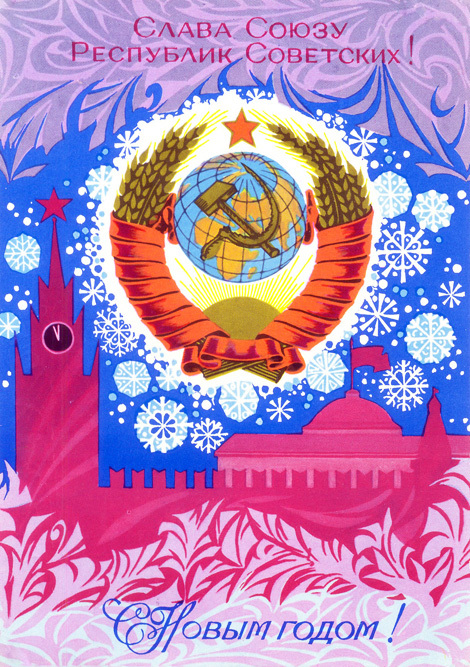 In 1980, the Soviet Union hosted the Summer Olympics. 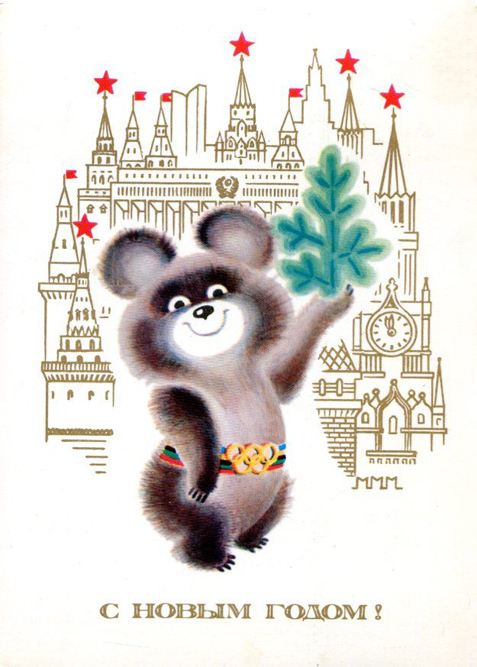 The symbol of the games, Olympic Mishka ("bear" or short for "Mikhail"), was on display everywhere, including, of course, New Year cards. 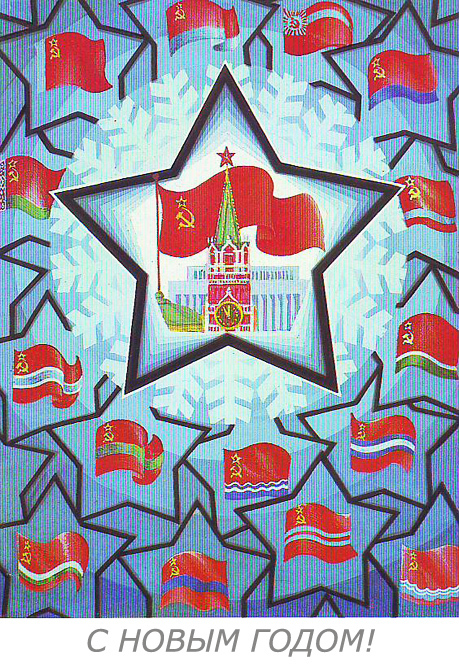 New Year cards said farewell to Soviet symbolism, and the country itself, in 1991. 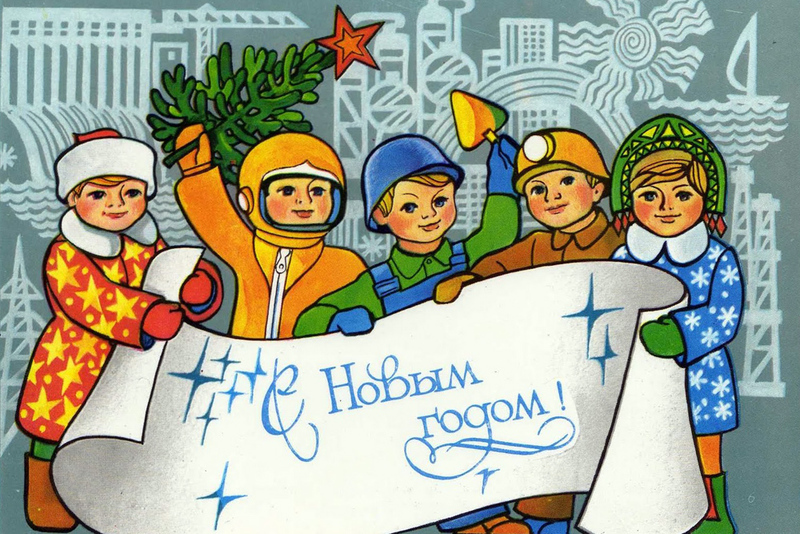 New Year cards in modern Russia no longer reflect current affairs, and workers have been usurped by American cartoon characters.